The Best Buddies International Organization led by Anthony Shriver Kennedy, has chosen the Crusade for a New Humanity Foundation of Alvaro Noboa, to work together, giving workshops for people with mental disabilities to work in his companies. The announcement was made by the businessman with his wife, Dr. Anabella Azín, at a press conference, along with Anthony Shriver Kennedy, who visited Ecuador to discuss project details. 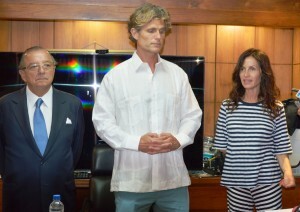 “For me it’s an honor the fact that he had chosen the Crusade for a New Humanity Foundation to support the work outlined in preparing people with mental disabilities to enable them to make office, computing, and more sophisticated works, thanks to science and the great working capacity of Anthony Shriver Kennedy, who has managed to raise the work standards of these people,” said Noboa. The call to register for the workshops will be through the media, Noboa said, adding that once completed the trainings, he will proceed to provide employment for these people in his companies, as he has been doing. “I want to give this great news, the Noboa Group is willing to employ these prepared people in its companies which are more than a hundred, and which are here in Ecuador and around the world,” he said. “Thank God we have friends like Alvaro and Anabella, who have helped us and have committed with the work of the Best Buddies Foundation (…),” thanked Anthony Shriver Kennedy, to the Noboa family. In addition, he said he was excited to share with the Ecuadorian foundation and be part of this social project.